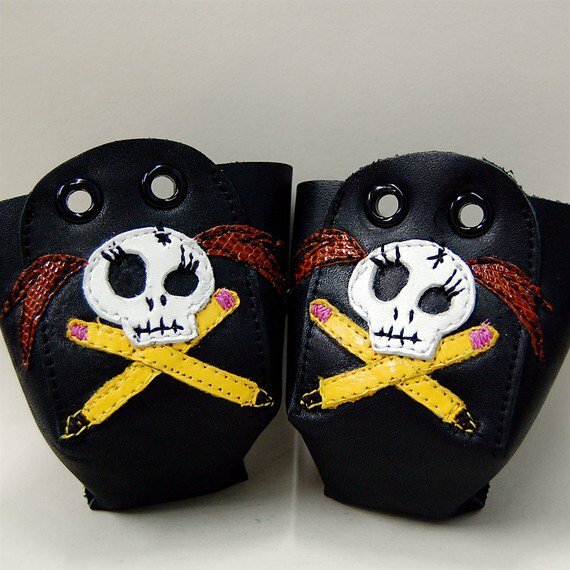 Back in August, I contacted Vixen DeBrawl from the Charlottesville Derby Dames—also known as Derby Vixen—to work on some custom nose guards for my roller derby skates. One thing you learn after buying fancy new skates is that they are going to get damaged—and fast. If you don’t end up buying nose guards, you might end up with your toes poking out of the snout of your skates (which is actually something I’ve seen from our own Shinobi). I bought these first, and made do with them for a long time, which didn’t stop the damage as much as it just protected certain areas of my skates. Derby Vixen’s amazing guards have way more personality, and after my friends Hammerin’ Diaz and Hella Hitzgerald picked up some of her awesome designs, I asked her about making some for me using my logo. I don’t think I could be happier. Well, except I have yet to actually receive them, and I’m still not healthy enough to get back on my skates. But I can’t even begin to tell you how excited I am to don my fishnets, my new Wonder Woman-style hotpants, and my wrtrgrl snouts and work my way up to being a roller derby badass. It’s time: Mary Lou Wretched is making a comeback! But wouldn’t busted up toes on your derby skates add to your bad-assery? I so love those. I wish I had some. And I don’t even have skates!